Toddler Forearm Crutch - 1 Pair Forearm Crutch w/ Half Cuff - Epoxy-coated toddler forearm crutches with open half cuff. Height adjustable grip to floor from 14'' to 21'' (36 cm. to 53 cm.) and grip to top of cuff either 4'' or 5'' (10 cm. or 12.5 cm.). Comes fitted with model T10 Pivoflex tips. Available in 4 colors. Please send an Amazon email with color selection. 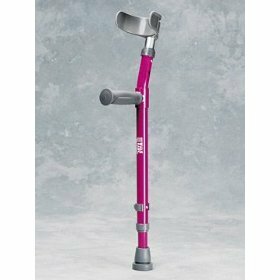 Toddler Forearm Crutch - 1 Pair Forearm Crutch w/ Half Cuff - Epoxy-coated toddler forearm crutches with open half cuff. Height adjustable grip to floor from 14-18 inches and grip to top of cuff 5.5 inches. Comes fitted with model T10 Pivoflex tips. Available in Deep Blue, Fire Brick Red, Neon Pink, or (Barney) Purple. Please send an Amazon email with your color selection.